A final destination to your search for Tollywood Singers' Profiles (I would rather like to say Profiles of all Singers who sang songs in Telugu Films). Out of my passion for breathless songs, I also listed few breathless songs I came through so far. Born 4 June 1946) is an Indian playback singer, actor, music director, voice actor and film producer. He is sometimes referred to as S. P. B. or Balu. He won the National Film Award for Best Male Playback Singer six times. He won the Nandi Awards 25 times from Andhra Pradesh. Balasubrahmanyam was born to S. P. Sambamurthy in Konetammapeta of Madras Presidency, present day Nellore district in Andhra Pradesh in a Brahmin Family. 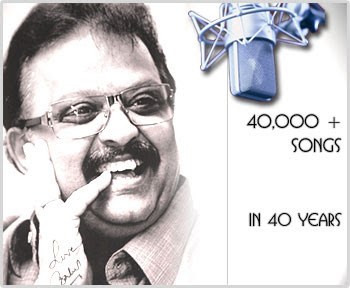 Balasubrahmanyam's father was a Harikatha artist who had also acted in plays.He has two brothers and five sisters. He is the elder brother of singer S.P. Sailaja.He is married to Savitri and has two children, Pallavi and S. P. B. Charan who is a playback singer and film producer as well. As an actor he played roles in films like Pakkinti Ammayi, Parvathaalu Paanakalu, Pelli Varamandi, Kalyanathasava, Malle Pandiri, Raja Hamsa, Minsara Kanavu, Manathil Uruthi Vendum, Thiruda Thiruda, Keladi Kanmani, Sigaram, Maya, Avvai Shanmugi, Ratchagan, Nandhini, Kadhalan, Prema Maha Yedabidargi, Maya Bazaar. He has performed character roles in more than 45 films including Tamil, Telugu, and Kannada. He received Nandi Award for Best Supporting Actor for the Telugu movie Pavithra Bandham (1996) from the Government of Andhra Pradesh. He has composed music for around 40 films and albums like Seethamma Pelli, Bharyamani, Sandarbha, Bangaru Chilaka, Mayuri, Ramanna Shyamanna, Ksherasaagara, Devaralle Dane, Belliyappa Bangarappa beside few films like Muddina Maava, Sigaram, Unnai Charanadaithaen, Padamati Sandhya Ragam in Telugu, Hindi Tamil and Kannada languages. He also owns a production company called Kodandapani Film Circuits (now Captain cine creations) and produces film under this banner. Films like Subha Sankalpam, Bhamane Satya Bhamane were produced by him. "Umandu Ghumandu Ghana Gar Je Badara"
"Tumse Milne Ki Tamanna Hai"
Best playback Singer award from "Gemini Tv Ugadi awards" 2010 for the serial "Kotha Bangaram"
Vamsee Film awards 2010 "Best Playback Singer(male)" for the film "Mestry"
Santosham awards 2010 Best Playback Singer(male) for the film "Mahatma"
Lifetime Achievement Award - 2011 presented by Lux Sandal CineMAA Awards on June 19, 2011 in Hyderabad. Isai Thendral - Title conferred to S P Balasubrahmanyam by Botswana Tamil Cultural Association - Executive Committee (2011-2012) on April 14th 2012 in recognition towards his continuous dedication,contribution and commitment to the Indian Music and Film Industry. which keeps his public excited and breathless. See the link below for more info. Cinefocuz is the best portal for Telugu Movie News, Tollywood Reviews, ratings, Gossips, Photo Galleries, Release dates, Trailers, Teasers, Events and more.